One might summarize Wonder Wheel, this year's offering by the prolific Woody Allen, as being the epitome of what many would call, "meh." "Meh" is what one would call expressing a lack of interest or enthusiasm. "Meh" is what one could define as uninspiring or unexceptional and in the pantheon of Allen-produced films over the past fifty years Wonder Wheel certainly falls into the category of "meh". That said, the visual elements that see legendary cinematographer Vittorio Storaro (Apocalypse Now, Last Tango in Paris) shooting Allen's fifties-set melodrama like it were a postcard where the colors are saturated to the point they are about to burst off the screen are fantastic and serve to be the only thing that is somewhat memorable about Allen's latest effort. The sweeping sequences that involve Storaro's re-creation of Coney Island that is partly comprised of practical effects, part location B-roll, and other part full-on digital trickery would seem to encourage the movie to immerse the viewer in this setting and yet, even as the strongest facet of the film, the location serves as little more than a backdrop. A backdrop for yet another of Allen's explorations of the kinds of characters made famous in the likes of Tennessee Williams works that he's already explored in Blue Jasmine and has probably explored multiple times before that, but my Allen filmography knowledge gets a little spotty prior to 2005 sans the obvious stand-outs. 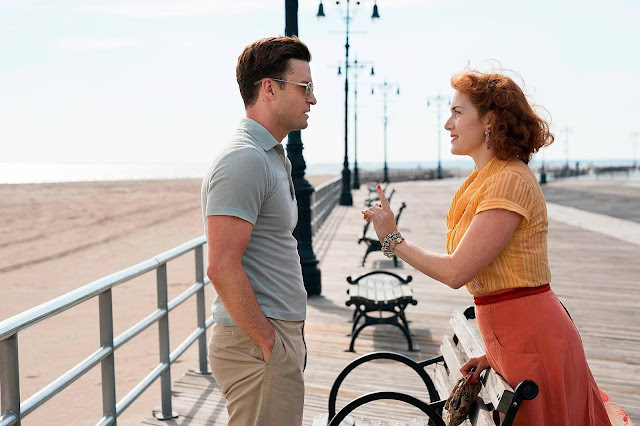 What I kind of expected from Wonder Wheel given Justin Timberlake's (yes, Justin Timberlake is your Woody Allen stand-in this time around) delivery of certain lines in the trailer was that of an homage of sorts to (or even parody of) the big melodramas of yesteryear where the actors were performing with a knowing sense of what they were going for and of letting the audience in on the fact of what they were going for. Were this true and we, the audience, ended up laughing with the movie instead of at the movie it might feel like a completely difference experience, but as it is Wonder Wheel is a movie out of touch with what it should be and what it needed to be in order to pull-off what it seemingly wanted to be. But hey, it really is visually stunning, so there's that. 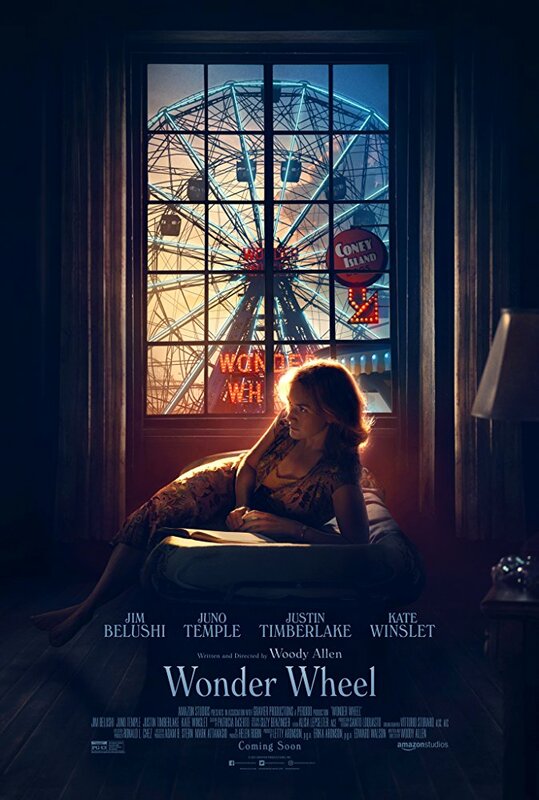 Mickey (Justin Timberlake) makes the mistake of getting a little too serious with Ginny (KateWinslet) in Wonder Wheel. And so, there we are in nineteen fifty-something Brooklyn, at the Boardwalk on Coney Island where we are first introduced to our narrator, Timberlake's Mickey, who is a lifeguard on Bay seven, but also a writer who had to drop out of NYU because of Uncle Sam. Mickey comes to notice the beautiful, but visibly sad Ginny (Kate Winslet) walking down the beach one day after everyone else has fled due to the threat of impending thunderstorms. The two strike up a conversation after making their way inside somewhere dry where Mickey is able to flaunt his reasons for not having yet returned to school and why he is biding his time as a lifeguard when what he claims to be and so often speaks in the language of, is a playwright and dramatist while Ginny only continues to ask questions for fear of having to answer similar questions about herself. The two not so slowly delve into a relationship that seems to very clearly be something of summer fling for Mickey, but something other-worldly for Ginny who is looking for a reason, any reason at all, to get out of her current situation. That current situation includes a waitressing job at the local oyster house, a second husband named Humpty (Jim Belushi) who runs the carousel on the boardwalk, and her young son, Richie (Jack Gore), an arsonist who can't seem to shake the habit. Ginny feels trapped in her current situation as she apparently married Humpty more out of gratitude than love and goes on and on to the young Richie about how it's her fault his father isn't around anymore and as such, has turned the kid into an incendiary that allows him to express the rage he feels against and for his mother who he otherwise seems to feel sorry for and towards a stepfather that obviously doesn't understand him. Add to these troubles of feeling inadequate and unfulfilled the fact the young, attractive daughter of Humpty comes back into the picture after years of resentment having been built-up between the girl and her father. Carolina (Juno Temple) comes into town at the onset of summer after leaving her husband, a gangster, who has marked her for knowing too much or for...some reason-it never really gives us much information around this set of circumstances other than the fact Carolina is a marked woman. Naturally, Humpty takes to trying to protect his daughter no matter how estranged they've been as of late, but what is more threatening to Ginny and the little world and life she and Humpty have created above the boardwalk where the titular carnival ride can be seen from their window is that of Mickey's interest shifting from the older, married woman to that of the young, damaged divorcee. Typically, in Allen's lesser movies it is at least charming to see the performers, especially the new ones, try out his dialogue and take on his style for the first time, but even that is somewhat tainted here with Timberlake. In all honesty, Timberlake is kind of terrible and doesn't convey the right inflections or necessary snark in order to be the Allen surrogate in the same way Jesse Eisenberg, Joaquin Phoenix, or Colin Firth have done as of late. The multi-hyphenate doesn't even make Mickey his own type of scorned, romantic writer in the way Owen Wilson did in Midnight and Paris, but more than ever-Timberlake's recognizable bravado and natural swagger don't carry over to his acting work and ring totally false for this intended persona who is an academic and not an international pop star. On the other side of things, Winslet literally has to carry the entirety of the picture-including the core of the conflict that is her relationship with Timberlake's character. The more interesting facet of Winslet's character is that of her loveless relationship with Humpty and his seeming obliviousness to her feelings when it comes to her failed dreams. He gets her a birthday gift that he openly admits he bought for extra cheap off a drunk guy on the boardwalk who stole it or that Carolina is better than being a waitress her entire life to which Ginny questions why she doesn't fall under the same perspective as his daughter. Why is she not better than being a waitress for the remainder of her life? This would seemingly have an obvious answer, but it is through this kind of dysfunctional dynamic and association of who deserves what more that, as the film goes on, Ginny becomes more and more unbearable herself. Ginny becomes more and more wrapped up in the fact that the older she gets and the less she has accomplished only mean that the chances of her accomplishing as much grow smaller and smaller. Ginny is a woman whose ambitions never became a reality and she doesn't seem to understand how she is pushing away everyone in her life when she feels she has so much to offer. This is a movie that chronicles two people who have never owned up to who they eventually thought they would become and are more or less forced to come to terms with the fact that taking avenues that are instantly gratifying rather than putting in the hard work to pay dues and have a real shot at their ambitions is what they seem to excel at. It is in this voyage of self-discovery that Wonder Wheel hits upon its most interesting facet, but it is a mix of too little too late in terms of drama and intrigue as everything in the film has led to this certain point, but it is this point that produced the best part of the story rather than the story leading up to it that we've been subjected to for an hour and a half prior. Carolina (Juno Temple) is the estranged daughter of Ginny's new husband who returns to Coney Island for protection. 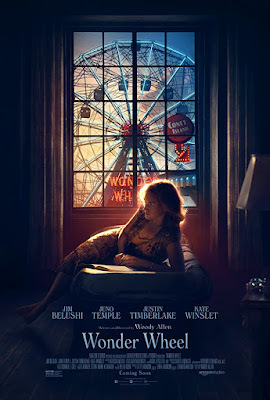 In essence, Wonder Wheel becomes this chronicling of a woman slowly losing her cool-going into "massive hysteria" if you will, and while Winslet more or less goes for broke here her performance isn't enough to make it feel like anything of note actually gets accomplished in the film. And naturally, this is the biggest detractor for any movie-audiences want to feel like they witnessed something-anything at all-but while Allen's picture certainly has a lot of intended drama within its standard love triangle set-up and all the complications that come along with such it can't help but feel as if each revelation Allen takes his time with here could be seen coming from a mile away and are therefore little more than natural progressions in the story and not the revelations they are positioned as within the context of Wonder Wheel. Rather, these vaguely interesting character arcs become recognizable patterns through dialogue and action where Ginny is a woman who brings about her own downfall time and time again; unable to get out of her own way every time something potentially promising or inspiring happens to her. I will admit that this characterization and Winslet's portrayal of such does lead to a few choice monologues where, for a brief moment, it seemed the film might inhabit that cognizant quality as touched upon in the opening paragraph, but these are too few and far between to really register in the long-standing impression of Wonder Wheel or what did or did not work about it. Wonder Wheel will be remembered fondly for the gorgeous photography of the period location while often overlooked and even dismissed for the familiar themes and terrible miscasting of Timberlake in one of the lead roles. This doesn't necessarily make me sad, Wonder Wheel isn't a good movie, but there are good things about it. Mostly, this will fall on Winslet's tragic human condition and how she has to lie to herself to live with any kind of peace. There is also the running bit with the kid who makes fires and aside from the cinematography and periodic moments in Winslet's performance, is the best thing the movie has to offer. This feels explicitly like a piece from Allen's own life that he took a note of and held onto until he found a script that could use such a subplot. I don't know if Wonder Wheel necessarily was the film calling for such a subplot, but I'm glad Allen included it here as it is one of the few elements that allow it to stand apart from being an otherwise pointless exercise in themes and ideas Allen has explored in other, better offerings.